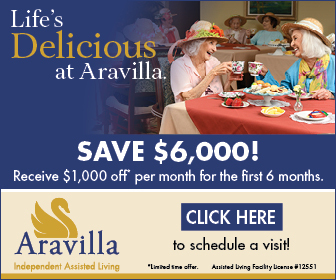 Aravilla is a growing organization, with new senior living communities in various stages of development throughout Florida. Our company’s original assisted living community in Florida, Cabot Cove, is established in Largo and offers our signature senior lifestyle. In Sarasota, our flagship Aravilla community provides exceptional memory care, with an exciting, brand new assisted living community now open. Additional communities are planned for Osprey, Florida, between Venice and Sarasota, as well as Clearwater, Florida.